AutismAsperger.net is the web home of Stephen Shore, author of Beyond the Wall: Personal Experiences with Autism and Asperger Syndrome. AutismAsperger.net serves to build greater awareness of the autism spectrum and in particular, Asperger Syndrome. It joins other websites with this same focus and will work together with them toward strengthening our community of people on the autism spectrum. I hope autismasperger.net will help people appreciate those on the autism spectrum for who they are and participate with them to develop strengths and make accommodations for challenges. Recently produced during my New Zealand and Australia speaking tour this video focuses on promoting strengths as a pathway to success for people on the autism spectrum. Now in my 5th year as a professor of special education at Adelphi University, my travels to educate and raise awareness about autism continue, having presented in 46 out of the 50 United States, and in 32 countries across 6 of the 7 continents across the globe. MOSCOW, RUSSIA - Russia Today TV. Prime Time interview on how Stephen Shore overcame some of the challenges of being on the autism spectrum and a focus on using strengths rather then deficits to empower people with autism to lead fulfilling and productive lives to the greatest extent possible. MOSCOW, RUSSIA - Russia Today TV. Sophie & Co. Autism - this phenomenon was defined in the science relatively late, but the number of people with the disorder is growing each year. It is far from being clearly understood, as it core reasons lie concealed, breeding many myths around it. Is autism an illness? Could one benefit from it? Are people on autism spectrum so different? And most importantly, where is their place in the human society? To find answers on these challenging questions, we talk to a man of science, professor, author and lecturer; the man diagnosed with autism himself. 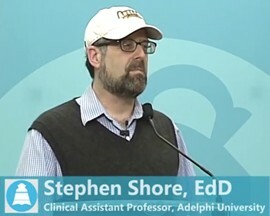 Dr. Stephen Shore is on Sophie&Co today. Stephen M. Shore, EdD, Clinical Assistant Professor, Ruth S. Ammon School of Education, Adelphi University, offers practical solutions for considering characteristics of autism as potential springboards to success in education, employment, effective self-advocacy and meaningful engagement in the community. MOSCOW, RUSSIA - Moscow 24 TV. My life with autism from the non-verbal days and recommendations for institutionalization to being a professor of special education, internationally known author and presenter on autism, and giving music lessons to children with autism. I emphasize that individuals with autism should have the same opportunities as everyone else. Stephen shared his belief that a student's strengths and interests are integral to the school experience. He charges teachers to find creative ways to recognize and incorporate these passions. Authored for the Jerusalem Post in conjunction with presenting at the www.icare4autism.org international conference, August, 2013. Turning away from closed doors and opening new ones (35 minute presentation). New!!! Stories and research on college for students with disabilities! "You are not college material" or "you don't belong in college" are comments frequently heard by students with autism and other conditions. With higher education frequently an expected part of the transition to adulthood this book includes practical advice to encourage self-advocacy in students with disabilities, and to support the professionals who are facing the challenges alongside them. Edited by Pavan John Antony and I, this volume shares personal stories of individuals such as Dena Gassner, Patrick Kelty, Kerry Magro, Melissa Mooney, Ehrin McHenry, and others, who describe both the challenges and successes of their time in higher education combined with the latest research on effective practice from Mitch Nagler, Francine Conway, and others. What can we do to make sure people with disabilities DO belong in higher education? See the latest comments by Dr. Benzinger about this book! Stephen Shore presents at Musashino Higashi Gakuen near Tokyo, Japan. Living Along the Autism Spectrum - What Does It Mean to Have Autism or Asperger Syndrome? by Daniel Gottlieb, Ph.D., Robert Naseef, Ph.D. and Stephen Shore, Ed.D. Understanding Autism for Dummies by Stephen Shore and Linda Rastelli; foreword by Temple Grandin. Ask and Tell: Self-Advocacy and Disclosure for People on the Autism Spectrum, edited by Stephen M. Shore; foreword by Temple Grandin. Copyright © 2016 Stephen Shore, all rights reserved.